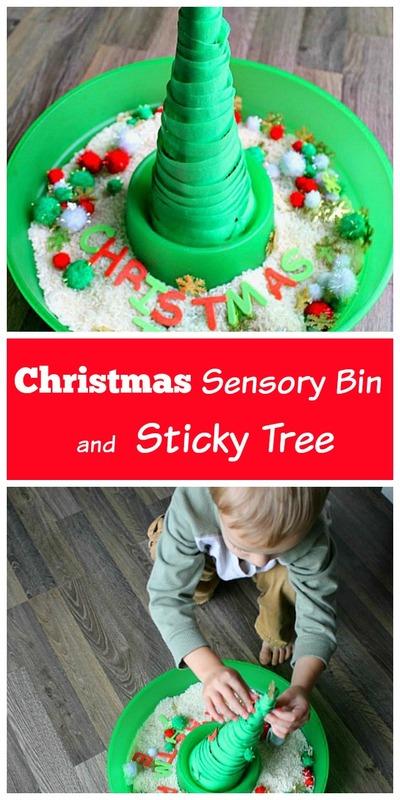 This Christmas sensory bin is so fun and full of learning for all ages too! As you may recall, in our house we have a thing for painter’s tape …. and also for sticky trees. So, you likely won’t be surprised that for our Christmas sensory bin we added in a sticky Christmas tree too. 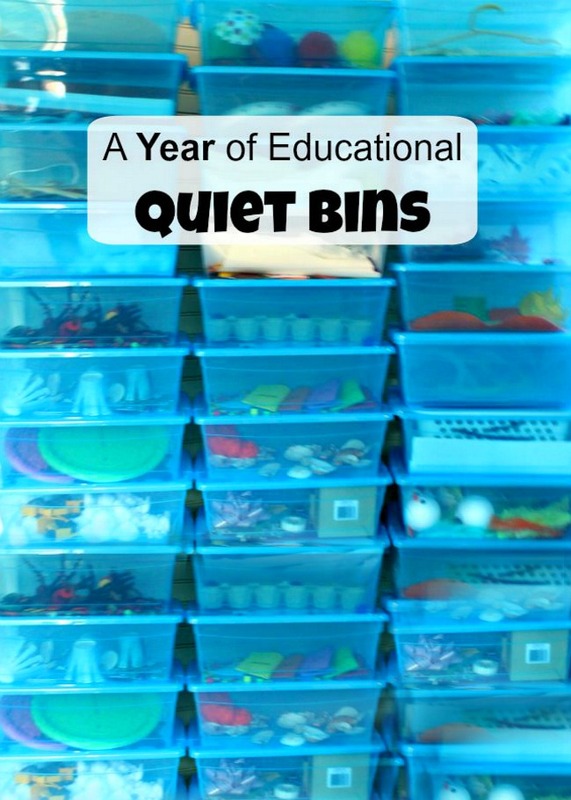 This sensory bin can be used for kids of all ages. Sammy (3) and Madeline (11) both used the same bin, though in quite different ways. To make this bin, I simply filled a container with white rice. 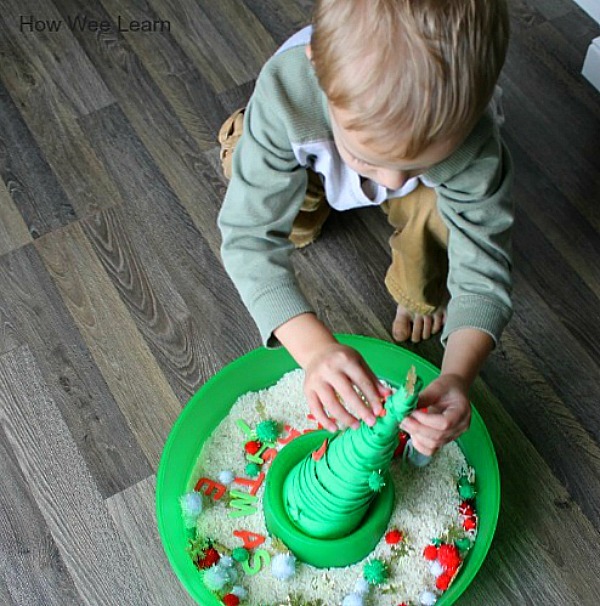 I like to use plain white rice for my sensory bins as much as possible so I can use them again and again. I just add in different things to the rice. For this sensory bin I added in some Christmas coloured pom poms, little snowflakes, and the letters for ‘CHRISTMAS TREE’. To make the sticky Christmas tree, I rolled up cardboard to look like a tree and then covered it with painter’s tape, sticky side out. Buggy and Buddy made a cute felt Christmas tree which would work well too. I used a plastic veggie serving tray for this activity because the tree fit perfectly in the middle and I was hoping this would prevent it from falling over (which it sort of did). This was an issue we had with our last sticky tree … always learning! Then the wee ones got to playing! Sammy immediately started running his fingers through the rice, sorting out some of the pom poms, and enjoying the sensory part of the activity. After a little while he started sticking things onto the Christmas tree. He likes to chat to himself while he works, which I love as it gives me a little insight into what he is thinking about. During this activity I could tell he wanted the tree to be covered completely with decorations. When Madeline had a chance with the bin, she started decorating the tree as well. She made pretty patterns out of the pom poms wrapping them around the tree like garland. The first time I introduce an activity like this I try very hard not to give any suggestions or add in any advice. 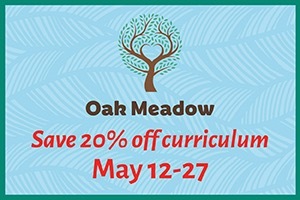 I have been quite amazed by all of the learning that comes so very naturally if I just prepare the activity and sit quietly, or play my wee ones way. what is the longest word you can make from those letters? how does the rice/snowflakes/pom poms/tree feel? 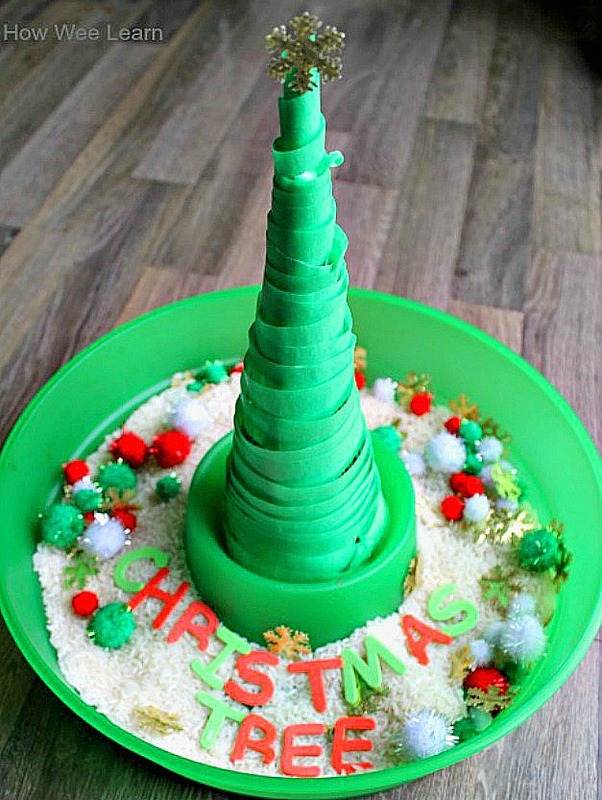 There is so much learning that can be done with this simple Christmas sensory bin. And it was quite mess free too! Decorating our Christmas tree is always a favourite family tradition in our house. Making a Christmas tree for my wee ones to easily decorate, any time they like, is a fun way to draw on their interests and bring learning to life. There you have it friends! Hope you are having a lovely week. We are slowly settling into our new routine! Sammy loves school – I will tell you all about it soon. Have a fabulous Thursday! Absolutely love this! We’ll definitely have to give it a try. Cute! 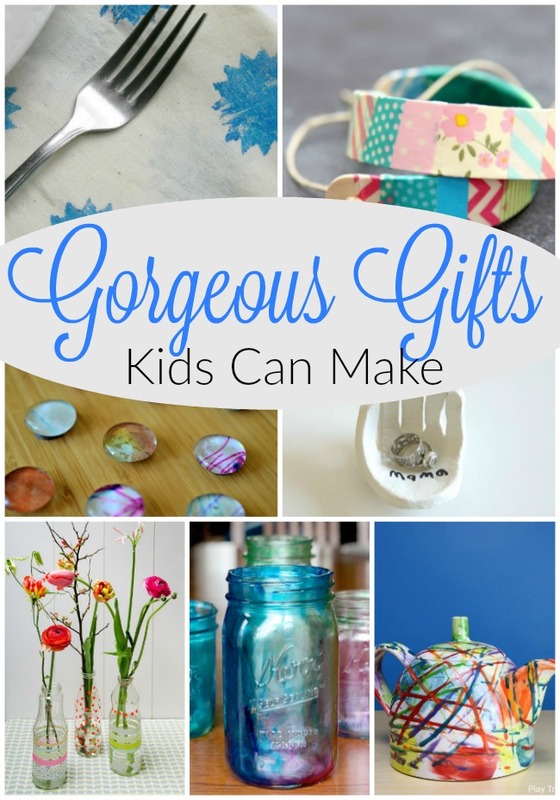 Definitely pinning this one! This is amazing… and Rice? I was wondering about that too..
That sticky tree is seriously awesome!! SO COOL! Thanks Dyan! So glad you like it! This looks like a blast!!! Now I’m wishing the tape I had on hand was green and not blue :). I think I’ve seen blue Christmas trees before 🙂 So glad you liked the idea! Gorgeous. I especially love that tree.